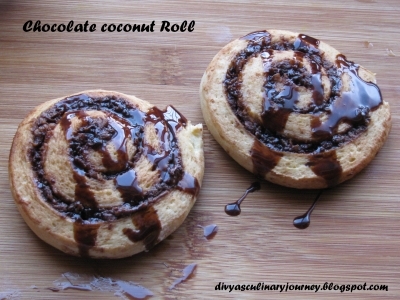 lovely rolls...coconut would be a lovely addition..
Omg, mindblowing rolls, prefect swirls and truly irresistible.. I was thinking about these swirls with nutella only yesterday, looks delicious..
Looks wonderful Divya, I am sure my kids will love this!..thanks for sharing.. Sounds awesome! I personally love the chocolate-coconut combo but not my kids! chocolate and coconut wonderful combo and they looks so tempting. Beautiful rolls. It will definitely be a hit with kids. Yummy rols. looks perfect.Chocolate and cocnut lovely combo. Very tempting rolls!!!! Lovely click!!!! Nice one Divya. Love the color of the coconut chocolate rolls. Absolutely delicious!!! Lovely swirls..but how do we make them eggless? You can omit the egg and add 2 tablespoon of yogurt instead. Looks nice. Will try the eggless version for my lil one..
Would be a treat for kids. They look amazing.